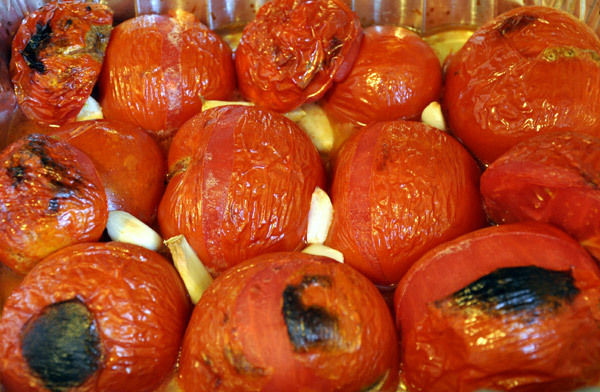 Dr Grub » How to save a dime by roasting tomatoes in an oven? How to save a dime by roasting tomatoes in an oven? Usually tomato vendors in any local farmers market sell slightly damaged organic tomatoes at a huge discount. Most of these tomatoes have small bruises due to transportation. I love getting these tomatoes for my sauce or to use as a base ingredient in my future dishes. Since I can’t store them fresh, I oven-roast them in a big batch and get my own roasted tomatoes. Before I dive into how to roast tomatoes, I want to thank my cousin R’pa for her suggestions. I was searching information on how to roast tomatoes in an oven but couldn’t find any that I liked. So, naturally, I called someone who I thought would know. Wash tomatoes. Cut into half. Lay tomatoes face down for proper browning and caramelization of tomato skin. Broil at 500 ˚F (260 C) for 15 minutes in order to caramelize the skin. Lower 45 minutes at 375 ˚F (190 ˚C) for to roast the tomato. This is also a good time to add peeled cloves of garlic or cut onions to flavor your roasted tomatoes. 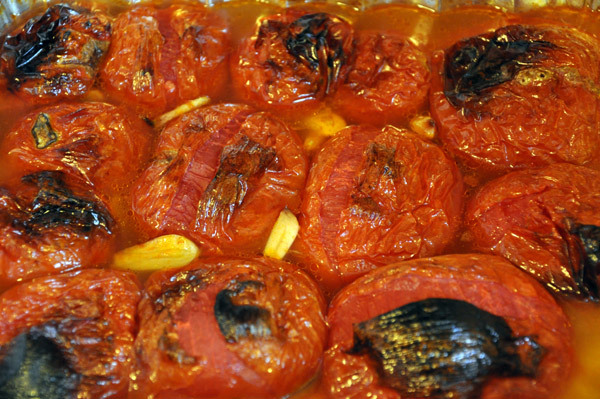 These roasted tomatoes can be used to make sauce or ingredients for future dishes. I often blend these roasted tomatoes for future sauce or cooking base. I would recommend the following steps only if you are directly using tomatoes as a sauce in a tomato-rich dish. 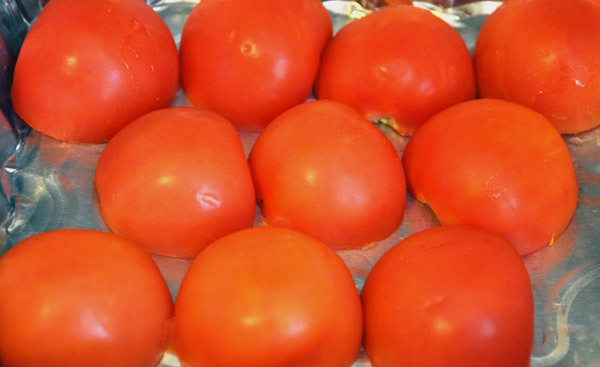 Further bake the tomatoes in 300 ˚F (150 ˚C) for 2 hours to get well cooked roasted tomatoes with a slightly stronger flavor. This is due to more slow-cooking of tomatoes and evaporation of water. The flavor is somewhat similar to wet sundried tomatoes. 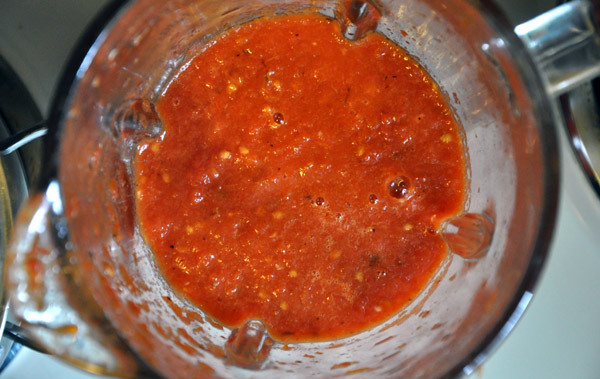 This can be directly blended and served as a sauce with your favorite seasoning. Storing roasted tomatoes. You can store tomatoes in old pasta jars. Make sure to sterilize them by heating the jar at 250 °F (121 ˚C) for 15 minutes. Make sure to cool the jars before pouring the sauce. Store the sauce in refrigerator. Roasting and storing your own tomatoes gives convenience of canned tomatoes with custom-made flavors but without any chemicals. Organic doesn’t mean it’s free from processed chemicals. Have a happy chemical free eating! Hey, what a great idea! I make my own tomato sauce, but I used canned crushed tomatoes. I really need to try this out. Thanks for the tips! @lacey – a sweet pea chef, let us know how your own oven-roasted tomato sauce turns out. Great idea! One would never need to buy tomato sauce/paste/pasta sauce etc. And I bet these can be frozen too (in sealed plastic containers)to store for longer periods. @Nan, freezing roasted tomatoes (or sauce) is a great idea. I will definitely try freezing some portion of my next batch. Lets see how frozen roasted tomatoes turns out. I got 3lbs of tomatoes from Eastern Market last weekend for $1.00/lb. Tomatoes get more expensive as we get into fall/winter. I am chopping mine up and freezing them for future desi recipes (as instructed by my mom). @Kinza, I didn’t know tomatoes in the Eastern Market in DC are that cheap. I never thought about just chopping them and storing. Let me try that too when I freeze roasted tomatoes. I am all about quick and easy. Your method looks great especially for regular tomatoes, although regular tomatoes work my way too. I have been slicing, roasting at a low temp and freezing tomatoes for 12 years. It takes a little time to slice them but they roast so much faster. I like a low oven temperature because I get involved and forget sometimes what I am doing. A low temperature gives you more forgiveness of forgetfulness. I do have a recipe: http://michigancottagecook.blogspot.com/2010/07/roasted-tomato-zucchini-and-brown-rice.html that I do tomatoes at 400° but have to watch carefully. I love tomatoes, but only roasted them once. I put them in the oven for 1 hour at 400 drizzled with balsamic and oil. Then pureed them w/a bit of sugar and half and half for an awesome soup! @Julie, I agree that low temperature and slow heating will be easy and flavorful as well.. 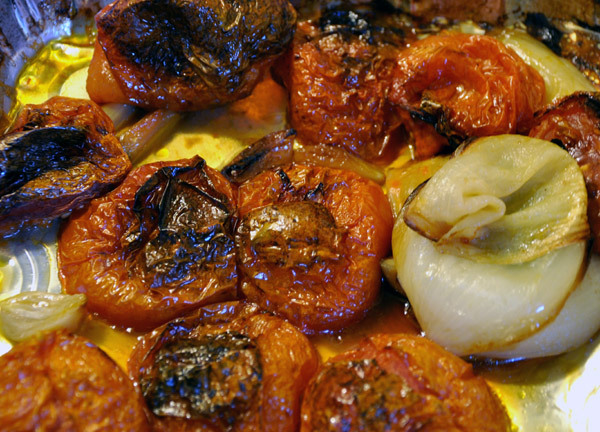 Here, initially high heat was applied to caramelize the tomato skin. I wanted to get similar results as grilling tomatoes without luxury of outdoor grill. @Olga, your tomato soup with balsamic vinegar?, sugar and cream sounds delicious, easy and hearty. I need to try it soon.